The best canna lily seeds to select and grow are those that are perfectly formed, without any formation defects. 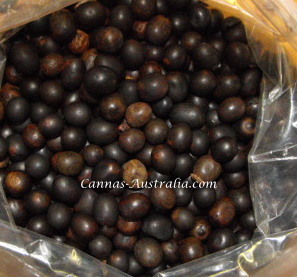 Checking viability of canna seeds is easy and fast and will save yourself a lot of time and frustration to which otherwise may lead to disappointment. 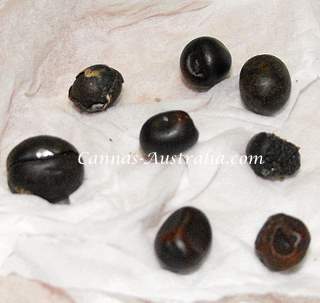 Canna seeds can either be perfectly round or oblong in shape, and the colours that ripe seeds can be are deep black whilst cannas produce seeds that are brown, some show light spotting on them and others have brown toned shades on them. It doesn’t matter what the color is, there is no right or wrong, the importance is that the seed is viable to grow with an embryo encased. When I harvest seeds there are often many that are no good for sowing, some show some obvious defects while others need to looked at closely to see if their good for sowing. Most of these are no good and it’s not hard to see why. Some are cracked, many have deep indentations on them from being tightly packed in the seed pods, three have rough seed shell casing and some didn’t develop their embryo. The most commonest reason for seeds not sprouting and growing is the embryo is missing or they have some cracking through them. The cracked seed on the far left of the is a good example of this, most cracking is a very fine hairline crack that need close examination and a sharp eye to be seen, they can often be split into two half’s with your fingernail to reveal no encased embryo. Seeds that are missing the embryo have a deep indentation on the end. The seed positioned highest in the picture above is a good example. Some indentations aren’t as easily seen as this one, sometimes the seeds need to be examined closer to ensure that all is how it should be.